I pulled myself away from the computer long enough to actually sew the tatewaku and mukaimon obi today. It turned out longer than most of the hanhaba obi I have, so I tied it in an extra fancy bow. 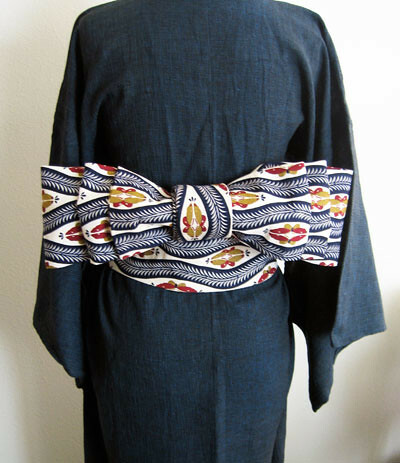 If you are familiar with how kimono are worn, you may notice the lack of fold at the waist below the obi. That’s because this particular kimono is very short, even on my mannequin! 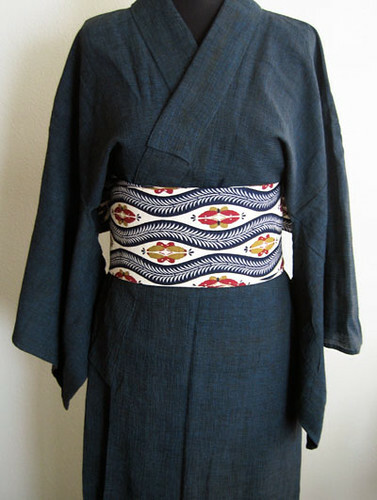 The kimono textile is light, somewhat crinkled, and a mix of blue and black. I don’t think it’s cotton, could be ramie or even a blend of some sort. At any rate, it will make a great summer house robe, so I plan on keeping it. The obi will be joining me at Fanime, so if you like it, you can certainly talk me out of it. I think it’s beautiful, but it’s longer than I’d like to tie on myself. The thick cotton of the obi gives it stability and makes it look nice and crisp without a stiffener inside. I’ve been taking time off from ebay to sort out my stock and get things ready for the show. It’s a lot to go through, and I’ve already got several boxes of kimono in storage in California that will need to be inventoried when I get down there later this month. Some of my vintage kimono, juban and haori have been listed on Etsy, however, as I want to try out the market there. Take a peek and let me know what you think. Don’t forget to leave a post to be entered in the Free Fiber Giveaway, coming up Tuesday, May 13th at midnight! Previous Post Let’s put on a show! That bow is AMAZING. I love the design on the obi as well. I think it goes well with the plainer fabric of the kimono, adding a little bit of color to the ensemble. Just beautiful. I got my first Yukata when we hosted Japanese exchange students in the early 90’s. It hangs in my closet because I don’t have occasion to wear it, but I admire the beauty and skill. I hear that a lot! It’s unfortunate that yukata aren’t worn more in the US. They are so very comfortable. That looks awesome! You are so talented..
How lovely! So talented. The fabric choice is perfect.